Robbins Pondweed has thick and course leaves with a more prominent vein in the middle. Robbins Pondweed has a main stem with leaves branching from it alternately. The leaves are brown or an olive–green color with parallel running veins and a more prominent mid–vein. 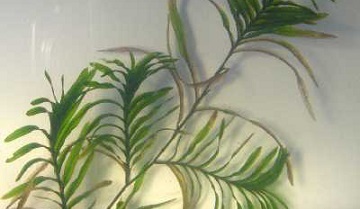 Compared to other ribbon–like plants, Robbins Pondweed has much more coarse and thick leaves. The stems can be as long as 10 feet and can creep along the bottom of the pond and root at multiple places on the stem. Popular in Canada and down from Toronto into Illinois, Indiana, Ohio, Pennsylvania, and in Washington and California. Dirbrox® herbicide and Hydrothol Granular will control Robbins Pondweed. You can order these products on this website.